Perfect for veterinarians, this design has small horse and bovine heads in the upper corners. 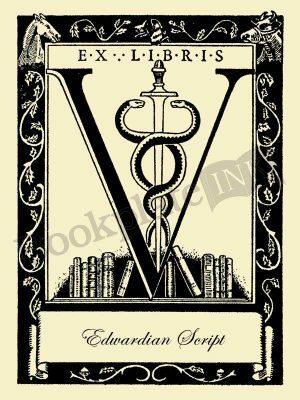 The “ex libris” text at the top means “From the library of.” This classic design was created by Jack Hubbard, a staff artist with Antioch Bookplate for many years. This veterinary design was introduced in 1948. More information on Jack Hubbard is available on the Yellow Springs Historical Society blog.